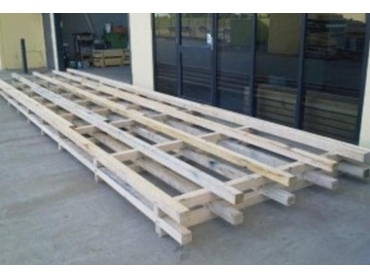 Sydney’s leading custom pallet, crate and skid manufacturer, Pace Pallet Services announces two new Extreme Over Size timber pallet designs to carry unusually long and heavy products. Managing Director Michael Mourad explained that their first challenge was to design an oversized pallet to carry stacks of cartons nearly twice the size of standard pallets. The pallets were required to flat pack DIY garden sheds so that they could be sold via a national retail chain. The cartons measured 2040mm by 950mm, nearly twice as long as standard pallets. Realising that a forklift or pallet jack would have to approach the pallet from the long side, the design team used CAD software to come up with a pine timber pallet to suit the unique dimensions of the cartons. An extension tine was placed on their forklift and the pallet successfully put through its paces with heavy loads of flat pack sheds. Being a one-of-a-kind pallet, the client who was keen to assess its strength and integrity, sent an OH&S team to conduct a lengthy series of tests. After the Pace Pallet Services design passed with flying colours, the client placed an order for 280 timber pallets. According to Mr Mourad, their next challenge was to design an affordable pallet for Australian Metal that could carry loads of steel products used in rail carriages and weighing up to two tonnes. The loads varied from six metres to more than 11 metres in length. This particular job was unique because the maximum length of pine timber was six metres. Additionally, the steel products were to be shipped from the Eastern Seaboard to Western Australia, which meant that the extra-long pallets had to survive a long journey. Thinking outside the box, the design team joined timber lengths to make up the required length without impacting the overall strength of the timber pallets. Michael chose pine timber over hardwood because it was more cost-effective but he had to design the pallets in such a way that they offered excellent integrity and durability. The final custom-designed solution demonstrates the company’s grasp of the engineering strengths of timber materials.